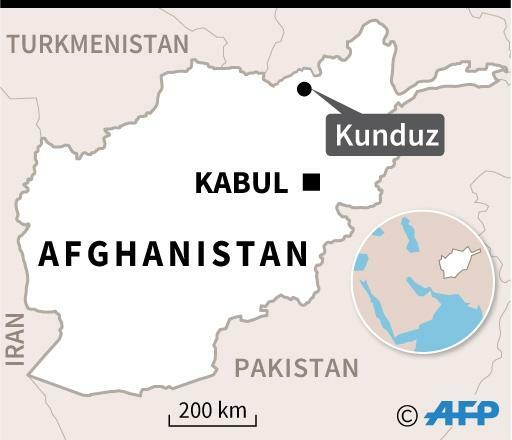 Kabul (AFP) - At least 13 civilians were killed, mostly children, in an air strike by "international forces" in the northern Afghan city of Kunduz late last week, the United Nations said Monday. The strike happened between late Friday and early Saturday in support of ground operations conducted by pro-government forces fighting Taliban militants in the area. "Initial fact-finding indicates that 10 of those killed were children, part of the same extended family whom were displaced by fighting elsewhere in the country," the UN mission in Afghanistan said in a statement. "Those who were killed were internally displaced families who had fled the war in Dasht-e-Archi district and had recently moved to the city," added Khosh Mohammad Nasratyar, member of Kunduz provincial council, saying three children were also wounded in the attack. The deaths come as ordinary Afghans continue to bear the brunt of the conflict, with more civilians killed in the Afghan war in 2018 than during any other year on record, according to a UN report. An increase in air strikes by US and Afghan forces also led to more civilian deaths in 2018, with more than 500 killed by "aerial operations for the first time on record". Fighting continues to flare across Afghanistan even as the US and Taliban press forward in peace talks aimed at ending nearly 18 years of fighting. The ongoing peace talks with the Taliban follow years of escalating violence in Afghanistan. Kunduz has been the scene of repeated air strikes gone awry over the course of the conflict, including an Afghan strike last April on an outdoor religious gathering in Dashte Archi that killed or wounded 107 people, mostly children, according to the UN. And in 2015, a US airstrike struck a Medecins Sans Frontieres (Doctors Without Borders) hospital amid heavy fighting in the area, killing 42 people, including 24 patients and 14 members of the NGO.